After the fire at the Metro Hotel in Ballymun, Dublin earlier this year, there is a renewed focus on fire safety and the threat of fire in high-rise buildings in Ireland. The Irish Fire and Emergency Services Association is calling for more training for firefighters, and architects want to make changes to the Irish fire safety certificate to make it clearer and more understandable. An important form of passive fire protection for steelwork used in construction is intumescent paint. Though steel does not burn, its structural integrity is damaged by the heat of a fire; intumescent paint for steel protects it from the ravages of the heat and allows vital extra time for evacuation and for firefighters to get a fire under control. In this article we look at intumescent paint for steel and how you can used it to protect your construction. We also look at the intumescent paint applicators and products available in Ireland. By expanding up to 50 times its thickness, intumescent paint insulates the substrate for vital extra time. “Intumescent” means swelling, particularly when exposed to heat, and describes the reaction that intumescent paint undergoes in a fire. Intumescent paint is the preferred method of fireproofing steel because the expanding reaction occurs at a temperature low enough that the strength of the steel substrate is not yet affected. This gives precious time for fire crews to get the fire under control without the risk of the building collapsing around them. At ~200/250ºC, intumescent paints undergo a reaction and swell to up to 50 times their original size, forming a solid foam-like char. Steel begins to lose strength at about 300ºC, and this increases rapidly after 400ºC. Given that the average housefire burns at about 600ºC and industrial fires are much hotter, this is a concern for building and human safety. Intumescent paint for steelwork protects the steel from the brunt of the heat and can provide up to 120 minutes of fire protection. There are two types of fireproof paint: Fire retardant and intumescent paint. These two coatings are used for different substrates and different fire safety requirements. Intumescent paint: As described above these expand into an insulating char in the presence of fire. They can provide fire protection for varying amounts of time, in half hour intervals from 30 up to 120 minutes. Most commonly used for steel substrates. 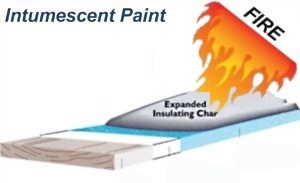 Fire retardant paint: Releases a flame-damping gas when exposed to fire, preventing the spread of fire across a surface and staving off the ignition point for the substrate. Though there are uses for fire retardant paint for steel, this is most commonly used as a wood protection coating. These satisfy the requirement of ‘not contributing to a fire’. Paint does not, as it can become fuel and itself burn. Intumescent paint and fire retardant paint can be combined in order to provide the highest degree of fire protection. The flame-damping fire retardant paint delays the swelling of the intumescent paint, working together to create the longest lasting fire barrier paint. 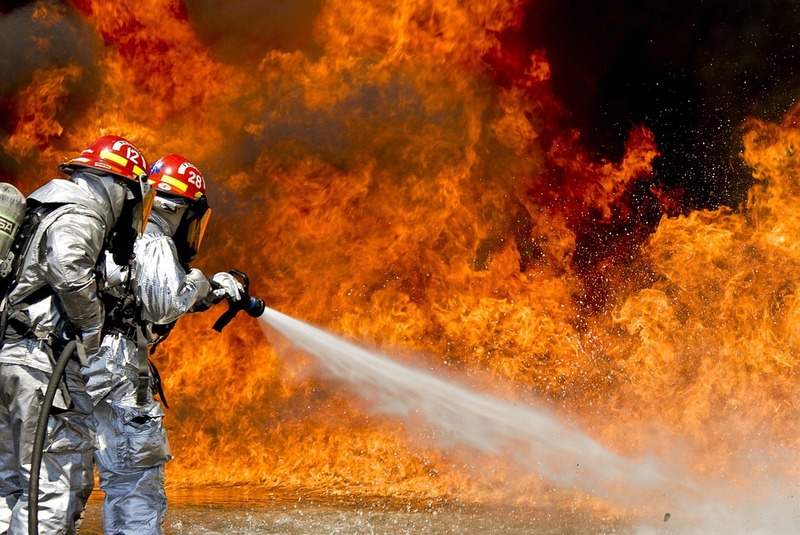 In order to adequately protect your building for fire, you need to consult with a specialist and have the coating applied by a trained professional – there is no sense in cutting corners when it comes to fire safety. For both intumescent and fire retardant paint, Ireland has legal requirements in order to gain a fire safety certificate. Thin film coating – The thin film coatings practically have three components: primer, base coat, and sealer. The base coat is the layer which expands and insulates against fire. These coatings are common in buildings where the fire resistance must comply to the requirements of 30, 60, or 90 minutes protection. Thin film coating applications can take place on site or off site. The on site applications usually involve a water-based paint system for health and safety requirements. It is possible to apply another coating on top of the fire protection layer to add aesthetic appeal. Thick film coating – Thick film coatings are usually intumescent epoxies which have a much higher thickness than the thin film coatings. These coatings are typically applied when the environment is too severe for the thin film coatings. The thick film coatings are most common in exterior steel structures, for example in skyscrapers and marine environments. Thick film coatings are suitable for on site and off site applications. They can also be supplied as pre-made casings. When looking for intumescent paint, Ireland has a number of contractors and applicators operating across the country on both the East and West Coasts. These professionals can apply fireproof coatings including intumescent paint to all substrates and help your building achieve fire safety certificate status. Man hours, paint volume, and application method all add in to the final intumescent paint cost. Below is a table just a few of the professional intumescent painting contractors working in Ireland. If you would like some more information, or have a project that needs intumescent paint for steel, get in touch! Our experts are here to help. In collaboration with our coating partners, we will find the intumescent paint coating solution for your needs. Simply use the button below or the contact form and let us know about your project so we can get started. Our quotation service is 100% free, so why not get int ouch today! Ardseal Clarinbridge, Co. Galway Intumescent coating application to all structural types, from stadiums to universities. Crowley Surface Coatings Ltd Callan, Co. Kilkenny Application of thin film intumescent protection of structural steel for 30-120 minute intervals. Flamestop Ltd Baldoyle, Dublin Application of thin film intumescent paint to structural steel for internal and external environments. Seamus Duff & Sons Ltd Dundalk, Co. Louth Intumescent coating applications to steel, suspended ceilings, and door for 30, 60, and 120 minute protection.